5″ x 7,” typically 32 pages of fiction, nonfiction, and poetry. Occasional illustrations (mostly in first two volumes). Advertisements confined to beginning and end of each issue. The Huntington Library’s website reports having a complete run of the magazine and notes that “it is very unlikely that another complete set has been collected” (“The Papyrus”). Other libraries with mostly complete runs include Davidson College, Ohio State University, Pennsylvania State University, Princeton University, and Cornell University. Scans of all issues are available online from HathiTrust. The Papyrus was a little magazine published between 1903 and 1912 under the editorship of Michael Monahan. It catered to a distinctly intellectual audience with an interest in literature; its content included poetry, short fiction, literary criticism, and comments on current events. “It is winter with the kings, but summer with the peoples who have waited long enough for their turn. Lustily are they girded up and made ready for the gleaning. Boldly and unitedly they march upon the ripe and waiting fields which, so often sowed with their blood and sweat, they now claim for their own. God grant they may bring the harvest home!” (January 1905, 1-3). “My Dear Michael: Your book reaches me so promptly after our happy meeting and verifies the old saying, Bis dat qui cito dat. (And what a satisfaction it is to be able to quote Latin without fear of seeming like an alien and a pedant! Oh, the vast desert of fatuous, facetious, and vulgar illiteracy, which seems to be so sadly inseparable from that democracy of which we expect so much! But can democracy produce or even tolerate distinction? Is it inevitable that we should speak only the jargon of Broadway? )” (January 1909, 6). Monahan tenaciously saw The Papyrus through an entire run of nine years and eighty-one issues (continuing it afterward as the Phoenix). The Papyrus shares the fiercely independent spirit of so many of its contemporary little magazines. It holds a unique place within this group, however, owing to the decidedly mixed social values of its editor. Monahan championed ideals of liberty and the rights of the working class, and he eloquently decried the imprisonment of Oscar Wilde in Papyrus’ May 1905 issue (1-5). At the same time, however, Monahan was proudly a literary elitist who, judging by the content of his magazine, had no interest whatsoever in the stylistic innovation typically seen as characterizing modernism. MacLeod’s description of his “old-school learned man-of-letters persona” is spot on (156). Furthermore, Monahan’s obituary described him as a crusader against feminism and noted that he complained specifically about female writers, despite being married to one (“Michael Monahan, Scholar”). Issues of the magazine were printed entirely in black and white, except for the color red, which was used on the outside covers. Three different cover designs were used during the magazine’s run: papyri and a scroll from July 1903 to October 1904; flowers from November 1904 to December 1905, and papyri in a fan shape from January 1906 to May 1912. The table of contents was always found on the inside front cover. There were approximately four pages of advertisements at the beginning and end of each issue; between these the content was entirely text with the rare exception of a picture or illustration (most of these appeared in the first two volumes). Witty or thought-provoking quotations from the editor sometimes followed the magazine’s larger pieces. Advertisements were usually for literary productions, including other magazines, books by Monahan or other authors, and bound volumes of Papyrus. The outside back cover held only a single quotation from Monahan, one of the magazine’s contributors, or an important literary figure. “The Papyrus has none of the Stock Features of the Other magazines, which make them All so fearfully Alike. It does not propose to review the Futile Fiction of the hour. It is for people who want to get away from the Eternal Trite–who are sick and tired of Canned Literature–who demand Thinking that is born of the Red Corpuscle. It is also intended for persons who are Young enough to Understand and all others who do not easily get into a Panic for some one to Blow out the Light. The Editor of The Papyrus is a Free Agent–which means that he is not controlled by Officious Friends, Advertising Patrons, or any other Influence subversive of the Chosen Policy of the Magazine. Fearless thinking and Honest writing. Hatred of Sham and Fake under whatever forms they may appear. 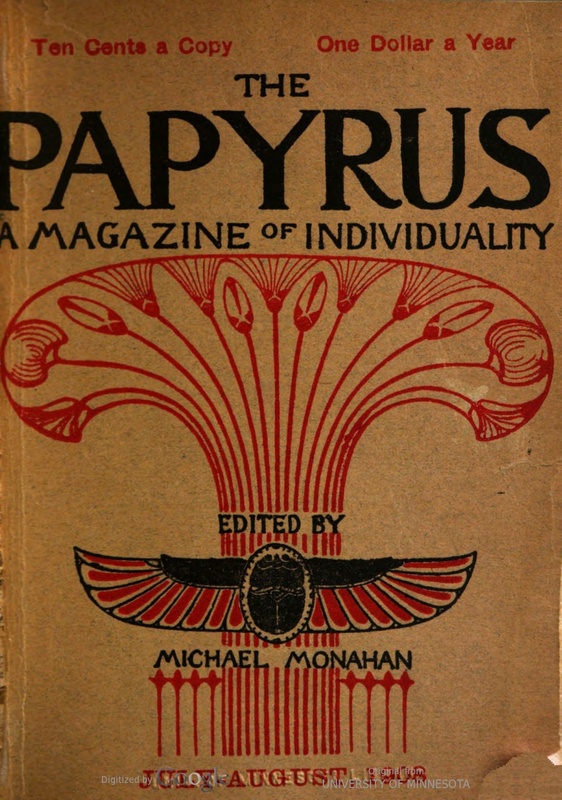 The Papyrus was the creation of Michael Monahan, who served as its only editor, and, for most of the magazine’s life, both owner and publisher (Publication shifted to Mitchell Kinnerley with the November 1910 issue). Monahan emigrated from Ireland to the United States when he was young. He received education from his father, whom The New York Times described as “a classical scholar.” Before beginning editorship of Papyrus Monahan worked for a newspaper in Albany, for the Democratic National Convention, and in the mayor of Albany’s office. In 1900 he went to Elbert Hubbard’s East New York colony, where he contributed to and assisted in editing The Philistine. By 1903 Monahan had tired of Hubbard (even, according to one rumor, kicking him down a flight of stairs) and moved to New York, where he founded The Papyrus in 1904 (Smith 25). He began editorship of The Papyrus around the age of thirty eight (“Michael Monahan, Scholar”). Maintaining the magazine was, at times, a financially strenuous position; Monahan was the father of twelve but managed to support his family mainly with Papyrus’ sales (MacLeod 155-157). Monahan had a dramatic writing style, which he employed extensively in The Papyrus to decry what he saw as “the Futile Fiction of the hour” and “Sham and Fake under whatever forms they may appear” (see Papyrus’ manifesto). “Editors of Individual Magazines.” Bruno’s Weekly 30 Sept. 1916: 1120-1122. Blue Mountain Project. Web. 18 Sept. 2015. Goode, Stephen H., comp. Index to American Little Magazines, 1900-1910. Vol. 2. New York: Whitston, 1974. Print. Hoffman, Frederick J., Charles Allen, and Carolyn F. Ulrich. The Little Magazine: A History and a Bibliography. New York: Princeton UP, 1947. Print. Le Gallienne, Richard. Michael Monahan: An Appreciation. New York: Printery of the Phoenix, 1914. HathiTrust. Web. 11 Oct. 2015. MacLeod, Kirsten J. The Other Magazine Revolution: American Little Magazines and Fin-de-Siecle Print Culture, 1894-1904. MA Thesis. University of Alberta, 2009. Web. 18 Sept. 2015. “Michael Monahan, Scholar, Dies at Sixty Eight.” The New York Times 23 Nov. 1933: 21. ProQuest. Web. 11 Oct. 2015. “Michael Monahan: The Survivor of a Disappearing Art.” Current Literature Mar. 1912: 347-349. ProQuest. Web. 10 Oct. 2015. Papyrus. HathiTrust Digital Library. Web. 11 Oct. 2015. “The Papyrus: A Magazine of Individuality.” Huntington Library Catalog. The Huntington, n.d. Web. 12 Oct. 2015. Smith, Herbert F. “Michael Monahan and His Little Known Little Magazine.” The Journal of the Rutgers University Libraries 24.1 (1960): 24-28. Rutgers. Web. 18 Sept. 2015.